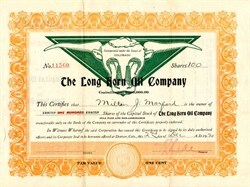 Beautiful certificate from the Long Horn Oil Company issued in 1920. This historic document has an ornate border around it with a vignette of a Texas Longhorn with oil towers spewing oil in a Long Horn Steer's face to make up the nose, eyes, and markings. This item has been hand signed by of the Company�s President, and Secretary, and is over 91 years old.